We’d love your help. Let us know what’s wrong with this preview of Stone Silence by Taylor Dean. I’m still waiting for that heck of a surprise to hit. It has proven to be elusive thus far. I’m pretty sure the entire world is lying about love Great big beautiful love. I’m still waiting for that heck of a surprise to hit. It has proven to be elusive thus far. I’m pretty sure the entire world is lying about love and the joke is on me. I know I want a man in my heart and in my life. Unfortunately, most men immediately push my OFF button and I lose interest quickly. Feeling pressure to prove I’m trying to find my soulmate, I finally give in and agree to a date. Huge mistake. Afterward I find myself abandoned in the middle of nowhere, in desperate need of help. That’s when I meet Stony by chance. He’s a silent and unsmiling man who intrigues me with his ability to keep going after life has knocked him down. Suddenly the abstract notion of love becomes tangible and within my reach. Once I experience it, I wonder how I ever lived without it. That’s when I stay with Stony by choice. But when Stony’s hidden past and present-day reality collide, his silence is broken. And the truth about his life nearly brings me to my knees. I can’t compete with ghosts from the past. I refuse to fight for a man’s love. He either loves me or he doesn’t. It’s as simple and as complicated as that. To ask other readers questions about Stone Silence, please sign up. There's no rhyme or reason as to why those first lines, just a shmorgishborg that happened to pop into my head to make you think of first lines. The excitement that can come. The loathing. The questioning if this book will be the one for you. The limitless possibilities of what's to come. "I don't know which way to go. The GPS is not helping. What am I supposed to do?" Finn pulls over and parks the car. "I don't know what to do." And that's the beginning of this book. A myriad of possibilities lie ahead. Who, where, what, why, how? Who is this person? Where are they going with the GPS? What is he talking about? Why don't they know which way to go? How are they going to fix it? I love opening books and reading that first sentence/paragraph and having all these questions running through my mind. I can't wait to dive in and see where this reading journey is going to take me. Isn't that what we all (or at least most all readers) love about reading? The adventure and the journey. Yes the end product is fabulous too because you've figured it all out. But it's the journey that's so important, because without each curve and twist and character and detail there would be no final culminating adventure. Happy sigh, I love these book journeys. Stone Silence was one of those lovely journeys for me. Unassuming, calm and a journey of growth and discovery. Two characters who have been on separate journeys, find themselves together through fate. For how else would they have found each other? Spencer, our female protagonist, finds herself in a strange circumstance, abandoned on the side of the road and left to find her own way. In the middle of nowhere she finds him. She asks for help and collapses. Stony saves her and helps her. As they come to befriend each other in their circumstances, the past and the future will collide. The question is...what choices and actions will come as this collision happens? And how will those choices and actions influence further collisions? I know I'm being vague, but I think that the synopsis does a good job of giving the little details you need for the storyline. My job is to share my thoughts, albeit sometimes in a roundabout way. I loved Spencer and Stoney. I loved the easy friendship and the moments of silence. Oh, and I especially loved the quiet whispers (plural because it happens multiple times) of confession. So sweet and loving! I was highlighting like crazy again in this book. Lots of smiles appeared on my face, a few frowns, several laughs came forth from my lips and maybe a couple grunts of disapproval. It was a very enjoyable read for me. I can't wait for the next two, which will be about a couple characters who were in this book. The only thing that I was hoping for a little more explanation, or maybe explanation isn't the right word because there was a good explanation. Maybe angst is a better word. More angst with the problem that builds throughout the book. The build up to it was great but the explanation given wasn't quite what I thought it was going to be. Don't get me wrong, I loved the characters reactions and counter reactions, and I did feel that the explanation fit ok but I was expecting something a little different as to why a person was where they were. I know more being vague, but sorry can't spoil it! The humor and romance were great and balanced out nicely with the moments of introspection and healing. Overall I really enjoyed my reading journey. Here are a couple quotes that I enjoyed. "It's as if I was looking at the world through a black and white filter before I met Stony. Everything looked drab. Now I see the world in full vibrant color. It's as if I've been awakened, even though I didn't know I was sleeping." "His fresh start just backfired on him. It's always best to let the truth be known from the get-go when it comes to relationships. Too bad I let that piece of wisdom escape me. It seems blareingly obvious right about now." "Hey Spencer, just wanted to say..."
"There must be more to his story...I'm dying to know everything. However, that particular emotion evidently kills cats, so I suppress it." "Whenever I go off like that my brother always quotes The Princess Bride and tells me, 'Truly, you have a dizzying intellect.' And I always tell him, 'Wait 'til I get going.' We're silly like that when we're together and I wouldn't change a thing." Well that's all I'll share for now. Some of them might not make sense unless you get to know the characters but they sure made me smile. There are lots more great lines that had me chuckling. Spencer and Stony sure have some great chemistry and humor between them. Definitely one I'd recommend to anyone who enjoys a good chick-lit with sweet romance and great characters. Can't wait for the next book in the series. Content: Clean. Kissing but nothing further. I received a review copy from ebooks. All thoughts and opinions in the review are my own. Oh man. I will always read everything Taylor Dean writes with no hesitation. Right now I'm feeling like one lucky girl that I get to read and review for her. I LOVE Taylor Dean books. If you have never read anything by her, you really must. This book was full of those emotionally charged moments that I crave as a reader. It's more than just chemistry and physical attraction, although that is there in abundance as well. There is a building intensity throughout the book and I was so caught up in it Oh man. I will always read everything Taylor Dean writes with no hesitation. Right now I'm feeling like one lucky girl that I get to read and review for her. I LOVE Taylor Dean books. If you have never read anything by her, you really must. A well told story in the first person is especially attractive to me. I feel like I'm right there experiencing the thoughts and feelings myself. Watching Stony through Spencer's eyes was especially yummy because, well, Stony is hot. Spencer thinks so, so therefore, I think so too. He's got so many layers of mystery surrounding him which he doesn't really give up easily but when he does? Hold on to your heart. I want to go back and read this book again. Right now. This book is part of a three book series, each about a different character that connects with part of a story line. You need to read the books in order but there are no cliffhangers. Thankfully the books will be released just one month apart so the waiting time will be minimal. I've been waiting for this book for what feels like forever. I'm so glad I don't have to wait too long before the next book! I knew after reading Chasing Fireflies by Taylor Dean that she would be one of those authors that I didn't pass on. I wasn't particularly compelled by the cover and description of this book, but I spotted some 5 star and rave reviews on Goodreads from friends that got me curious... and once I started reading it I blew through it in one morning. (One of those amazing mornings where the kids play so well together that I was granted the privilege of reading a book all the way through!) There's some I knew after reading Chasing Fireflies by Taylor Dean that she would be one of those authors that I didn't pass on. I wasn't particularly compelled by the cover and description of this book, but I spotted some 5 star and rave reviews on Goodreads from friends that got me curious... and once I started reading it I blew through it in one morning. (One of those amazing mornings where the kids play so well together that I was granted the privilege of reading a book all the way through!) There's something about the author's writing style that brings the characters and their thoughts to life for me, and I loved it. I was seriously mad for Spencer when she gets abandoned by the jerk date she was with, I was apprehensive for her while she was searching for help in the middle of nowhere, I was relieved for her when the person she came across was a decent human being and gentleman. The dynamics of Spencer and Stony were intriguing and I especially loved their chemistry together amid the embarrassing missteps and wondering and yearning. They bring out the best in each other and their journey to happiness, while not without conflict, was enjoyable to read about. (Especially when they finally get to that first kiss! Worth the wait!) It's the best when I genuinely like both main characters and feel for them as they navigate difficult circumstances. Can't wait to pick up the next two books in this series!!! I am always for books with wounded war vets and this one has one! I love books with families as an important part of their lives, again, this book has it too! And I love a good romance, again another check for me! Stony is a man with a furrowed brow and very little smile and he is respectful and kind and a man of few words. Intriguing indeed! Spencer is a woman who just can’t get into dating and has dated very little and wonders if her “great big beautiful love” will ever come to her. She is not I am always for books with wounded war vets and this one has one! I love books with families as an important part of their lives, again, this book has it too! And I love a good romance, again another check for me! Spencer is a woman who just can’t get into dating and has dated very little and wonders if her “great big beautiful love” will ever come to her. She is not on a good note when her latest date is not a good guy at all and just drops her off in the middle of nowhere Texas with no money, phone or water. She walks and walks until she collapses at the feet of Stony! He cares for her sunburn and heat exhaustion because the roads are flooded now and they are stranded. As they get to know one another, they fall for each other’s personality and they are kind of perfect for each other. The story is told in Spencer’s POV. The characters have meaning and character and the story is really quite cute! His eyes simply wander my face for a moment. My heart beats fast in my chest, almost painfully. Is this what love feels like? Tingly stomach, sweaty palms, dizzy head, grinding teeth, racing pulse and weak knees. Sounds like I have the flu. If you like medical stuff, dry humor, waiting till marriage, building your own home, flipping houses, vets, family or finding your great big beautiful love then this might be for you! This is still an AMAZING book and I still LOVE it! Definitely one of my favorite series! Spencer has been waiting for her big beautiful love her entire adult life. She starts to think that something is seriously wrong with her because she is repulsed by the touches of the men she has dated. She wishes that love would just hurry up and find her already. But alas, nothing. Until a horrible incident leaves her stranded in the middle of no where. Hours of walking in the Texas summer sun has her in need of water and facing heat exhaustion. She knows she needs to find help soon or she could very well die out in the middle of nowhere. Add in the fact that a torrential downpour is heading her way and she knows she needs to find help sooner rather than later. All of the sudden she hears a loud buzzing noise. She doesn't know where it's coming from but she just knows that she needs to follow that sound. She knows that this will lead her to the help she so desperately needs. The moment she lays eyes on Stony she knows that her life is about to change in a very big way. She feels an instant connection to him that she has never felt with anyone before. This man right here is going to change her life. They don't get off to the best of starts, but Stony soon comes to his senses and helps Spencer in her time of need. He nurses her back to health and has her feeling safer than she ever has in her life. But when the time comes for her to head back to her life, neither one of them are wanting to say goodbye. 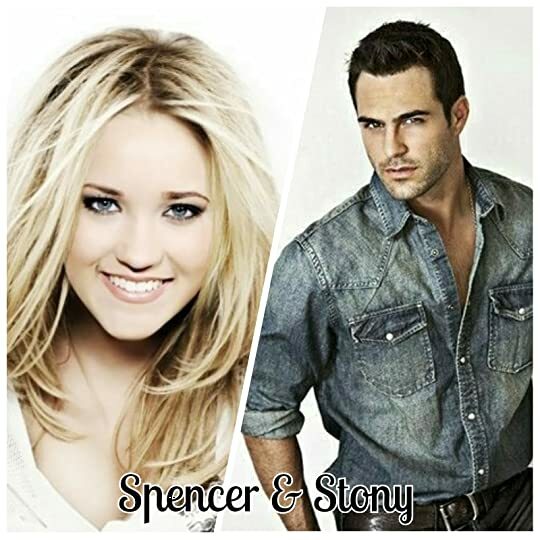 It seems fate has something special in store for these two because circumstances beyond Spencer's control and a job offer from Stony has her staying in the small town for the foreseeable future. This will allow them to get to know each other better and give them time to see where their new budding relationship will go. Life seems to be perfect and blissful until Stony's past comes knocking. All it takes is one moment, one look and Spencer is second guessing everything she has been feeling for Stony. Feeling blindsided she runs. She needs to get away before Stony can stop her. She's not going to make him choose between his past and his present. If she truly loves him like she knows he does, then she'll make it easy for him. She'll be the one to walk away even though it will kill her. But Stony refuses to let her go. He refuses to let his past get in the way of his present and his future. His future is with Spencer. He has never loved someone as much as he loves her. She looks at him and love radiates from her eyes. He would be an idiot to let her slip through his hands and he will fight to keep her in his life. He will prove his love for her and prove that she is his happily-ever-after! Oh. My. Gosh! I absolutely LOVE Stoned Silence! Talk about swoony! This book is AMAZING! I was sucked in from the very beginning and found myself lost in the journey of Spencer and Stony. I laughed out loud, got teary eyed, let out little dreamy sighs and refused to put this book down until I finished it! I devoured it! I am definitely looking forward to the other books in this series! I can't wait to read them! Ms. Dean has done an amazing job making me fall in love with more of her characters! I have loved all her books I have read so far and can't wait to see where she takes us next! As for my casting... I saw these two from the very beginning! What do you think?! I can't stop obsessing about this story and it's fantastically flawed and real characters. Love sometimes comes when it's least expected and that's just what Spencer discovers. A very scary and bad experience ends up being the best thing that ever happened to her. Although Spencer is in her late twenties, she's naive in the ways of relationships and love and I adored watching her discover her passion and emotional and romantic connections, especially with someone like Stony. He is like a stone-- I can't stop obsessing about this story and it's fantastically flawed and real characters. Love sometimes comes when it's least expected and that's just what Spencer discovers. A very scary and bad experience ends up being the best thing that ever happened to her. Although Spencer is in her late twenties, she's naive in the ways of relationships and love and I adored watching her discover her passion and emotional and romantic connections, especially with someone like Stony. He is like a stone--so hard to read. He has big secrets, a tragic past, and doesn't show emotion, yet there's something there that captivated Spencer...and me, especially with the way he would really talk to her. Taylor Dean is a fantastic story teller! The way the story unravels through her words is seriously fantastic. I loved every single minute--the good times, the hard times, and especially the swoony romantic times. I felt that I really got to know these characters--what made them tick, what drove them, what they were passionate about. Who knew that the middle-of-nowhere Texas would steal my heart?! Must read the rest of the series, ASAP, because I've got a serious book hangover. I loved this book! If Books 2 and 3 were already written, I would be reading them right now! Luckily, Book 2 comes out in a few weeks and Book 3 comes out in a month and a half so I won't have to wait too long. I love how Taylor Dean tells a story, and I love the story of Stony and Spencer. Spencer starts out in a precarious situation, and so she's not at her best when she meets Stony for the first time. Unfortunately, he's not at his best either. Fortunately, because of the situation they are fo I loved this book! If Books 2 and 3 were already written, I would be reading them right now! Luckily, Book 2 comes out in a few weeks and Book 3 comes out in a month and a half so I won't have to wait too long. I love how Taylor Dean tells a story, and I love the story of Stony and Spencer. Spencer starts out in a precarious situation, and so she's not at her best when she meets Stony for the first time. Unfortunately, he's not at his best either. Fortunately, because of the situation they are forced together long enough to get past first impressions. But Stony's past is a dark shadow hanging over their new love, and Spencer's innocence hasn't really prepared her to navigate those shadows. A very different story. I don't usually love books written in 1st person present tense, but I can read the authors' just fine. It just goes to prove, if it's done well, it works. Elliott meets Stoney in unusual circumstances. I had to suspend my belief of reality a little about their arrangement, but once I put it aside, I was able to keep reading. Stoney has lots of secrets, things that have really affected his life, but his heart is in the right place. Elliott is naïve and her disco 4 1/2 stars. Stoney has lots of secrets, things that have really affected his life, but his heart is in the right place. Elliott is naïve and her discovery and explorations, the way Stoney gets involved, the build-up of their relationship, the building of the house (the house and the yard! ), the moments in the trailer—all pulled me in more and more. There are also some hard moments, of course, but the ending was very sweet and totally worthwhile. I already read the 2nd and 3rd, also 5 stars. Does love really exist? Spencer Elliott is determined it does not. She just cannot catch a break. After a date gone wrong and being deserted in the middle of nowhere, Spencer is left to the help of others. Only the person who she asks for help wants her gone. Stony is a private man who has his own trials to work through. A man of few words he reluctantly agrees to help Spencer. I loved watching their relationship unfold. Both in need of trust and understanding they begin to heal. Spencer is a woma Does love really exist? Spencer Elliott is determined it does not. She just cannot catch a break. After a date gone wrong and being deserted in the middle of nowhere, Spencer is left to the help of others. Only the person who she asks for help wants her gone. I loved watching their relationship unfold. Both in need of trust and understanding they begin to heal. Spencer is a woman of strength. I admire her for her willingness to stand her ground and not be swayed in her morals. Stony is a true gentleman who needs love and forgiveness of himself. I cannot wait to read the other books in this series. A wonderful read and I purely enjoyed it. *Please note I received a complimentary copy. All opinions expressed are my own. A solid contemporary romance, “Stone Silence” has all the features of a winner of a clean romance. Read full review in the 2018 May issue of InD'tale Magazine. This book was a fun surprise. I don't normally love a book written in first person, but this book was definitely the exception. I had to make myself put it down so I could take time to savor every minute. The characters in the story were well written and developed. I enjoyed reading their story. I love Stoney and the way he communicates with Spencer. I love Spencer's open and honest way of living life. I look forward to reading more from Taylor Dean. I have always said Taylor Dean and I are on the same wavelength when it comes to how our minds work. This book once again proves it. She writes books that are books I'd write. This is really creepy, but a couple days before I started this book, I had a dream about a firefighter who lost his leg in an accident. In my dream, I told myself that my dream would make a good book. No, Stony didn't lose his leg by being a firefighter, but he did lose a leg! Other books she's written, have been things I' I have always said Taylor Dean and I are on the same wavelength when it comes to how our minds work. This book once again proves it. She writes books that are books I'd write. This is really creepy, but a couple days before I started this book, I had a dream about a firefighter who lost his leg in an accident. In my dream, I told myself that my dream would make a good book. No, Stony didn't lose his leg by being a firefighter, but he did lose a leg! Other books she's written, have been things I've thought of in the past. Another author I do that with is Kathi Daley. It's crazy! I think we must all be wired the same way when it comes to our imaginations! Anyway, Stone Silence is another great book by Taylor Dean. She based part of it on an idea she had when she and her husband got lost. She talks about this on her blog, so you need to go over there to read it! In this book, getting lost with a jerk of a guy is the best thing that could have happened to Spencer. She ends up meeting Stony. From their first encounter through the end of the book, you'll love Spencer and Stony's story. It goes to show you that a bad situation can end up being a blessing. Stone Silence is one of those books that draws you n from the first page. Spencer gets put into a very prickly situation, and hopes to find help at the mercy of Stony. At first Stony doesn’t want to give into the urge to rescue this woman in distress, but his heart is softened when he sees her predicament. The spend a great deal of time together. It forces them to get to know each other, and in the process they fall in love. For Spencer this is a new sensation, as she has never felt the pull towar Stone Silence is one of those books that draws you n from the first page. The spend a great deal of time together. It forces them to get to know each other, and in the process they fall in love. For Spencer this is a new sensation, as she has never felt the pull towards another, and she can’t quite explain this strong attraction. For Stony it’s hard on so many levels, because it forces him to face many demons from his past. And he has a whole lot, some real, some he has put up all by himself. They seem to be on the course to a perfect happily ever after, until Stony’s past catches up to him. It forces the couple to face their fears, their insecurities, and ultimately decide if what they have is worth fighting for. I loved reading this book. The raw emotions, the character growth, the tingling romance all had me reading this at record speed, and left me thinking about this book for long after I had put this book down. A great start to an amazing series. Spencer is beginning to think maybe there's something wrong with her. She can't seem to find a guy she likes, or ever really have a response where she's not repulsed by them men she has dated when they try to kiss or hold hands. According to her mom, she has a great big love out there just waiting for her. It'll just slap her in the face someday and then she'll know. Spencer keeps wondering if this is true, and if it is, when will it happen? After being abandoned by a date weekend gone bad, Spenc Spencer is beginning to think maybe there's something wrong with her. She can't seem to find a guy she likes, or ever really have a response where she's not repulsed by them men she has dated when they try to kiss or hold hands. After being abandoned by a date weekend gone bad, Spencer doesn't know what to do. She has no connections to anyone, and she's in danger. This is when she meets a man by the name of Stony. Her jerk of a boyfriend dumps her on the side of the road, abandoning her in the middle of nowhere because she won’t “put out”. He leaves her stranded without her purse, cell phone, water, or any clothes, in the middle of a hot, Texas summer on a deserted road. After walking for hours, she finally stumbles upon a lone house under construction and weakly asks for help from the stranger who is reluctant to help her in any way before she passes out from heat exhaustion. What follows is a remarkable series of events and twists and turns - a story well worth reading! I've adored every single book I've ever read by Taylor Dean. They are well crafted stories that hook you in by your heart strings and wrap you up in the emotions and the character development that has you rooting for these people that you grow to imagine in your heart. Lovely romance. The h isn't perhaps the strongest character, but still a sweet fall. Definitely a Beauty and the Beast retelling in a contemporary setting with the only 'magic' being the romance. Similar to *Beauty and the Beast* if Beast were a catch and a half from the get-go! Oh, Stony is something else! Why haven't I been reading Taylor Dean's books all along? The connection between the leads is so cool and I loved how the heroine finally found Love. Great book! I loved this book. I loved the characters (except for Finn-would have loved to see him go to jail). I loved the setting. I loved the writing. I loved that it was a clean romance. I loved the happy ending. Just all around wonderful book. Didn't take me long to read it, then I went and downloaded the next one in the series. Would have gotten the third one but it wasn't available yet. A cute and simple romance. An easy fluff book. If you had me describe Stone Silence in two words they would simply be Love Story. And one of the most wonderful kind- the kind that gives you butterflies; the kind that gives you the warm and fuzzy feeling deep inside; the kind that just makes you want to be happy. It all starts when we meet Spencer and Finn on their way back home from a horrible out of town date. We discover that Finn is, for a lack of a better word, a jerk. A jerk that throws Spencer out of his car in the middle of nowhere. Left stranded without any of her belongings, Spencer tries to find someone she can trust to help her. That’s when she stumbles upon Stony. The story that Taylor Dean managed to tell caught me by surprise. I just didn’t expect it to be so layered and different than what I was expecting. What I loved most about the whole thing is that it felt both realistic and unrealistic at the same time. I can’t really explain it exactly, but the things that I found unrealistic in the story, or the little faults I found, are exactly what made me love the story so much. It was because of them that the story reminded me of my own dreams of finding my own great big beautiful love. As anyone who ever dreamed of it could attest, these fantasies are all viewed from pink colored lenses, are optimistic as can ever be, and all too innocent. This is exactly how reading this book made me feel. I am not saying that the story doesn't have its complications, mysteries, and social commentary- because it does; but even if the road to happiness isn't smooth, at the end it makes it all worth it. I loved Spencer as a character. I connected with her voice (or should I say with the writing style?). What some people might find as too much rambling and description, felt really natural to me; this might be because I think that if I were to actually write myself it would be in a similar style. I have to say that at the end of the day, reading stone silence made me happy, and I very much had trouble putting it down. I desperately wanted to keep on reading and forget about anything else I had to do, whether it be sleep or work. But I still can't give it 5 stars, because I can't ignore the fact that the flaws are there and that I couldn't agree with all the messages that might be inferred from reading the story. Still, if you are after a clean and warm, happily-ever-after love story Stone Silence is what you are looking for. Even though I know sometimes all we want is to put our critical thinking glasses down and just enjoy some fuzzy love stories, I would recommend reflecting on the messages of the stories and whether or not you agree with all of them. For one, I really hope the big one here is true- that your great big beautiful love is out there. This review has been hidden because it contains spoilers. To view it, click here. I didn’t want to put this book down. I enjoyed the authors style of writing & I really appreciate that, despite the fact that due to circumstances the two main characters end up living together for the majority of the book, this is a clean book. Other than some kissing nothing else happens. Stony is the perfect gentleman. And I love how well Spencer understands him. I really felt for her situation at the end when Stony’s ex comes back onto the scene. I’m rather baffled at how she managed to I didn’t want to put this book down. I enjoyed the authors style of writing & I really appreciate that, despite the fact that due to circumstances the two main characters end up living together for the majority of the book, this is a clean book. Other than some kissing nothing else happens. Stony is the perfect gentleman. And I love how well Spencer understands him. I really felt for her situation at the end when Stony’s ex comes back onto the scene. I’m rather baffled at how she managed to get herself into the situation with Finn & becoming stranded in the first place with no phone/purse etc. I know as the reader we can see how things are going/what to expect so we reason this away, but there is still that “oh, come on” moment when I can’t believe a smart woman does something so naive. I would hope that this is not something that happened in real life that the author is drawing from. Of course, without this the story would have been much harder for the author to write so I just pushed forward with the reading & as I said, I couldn’t put it down until I was finished. I am a little disappointed by the fact that the reason for Stony never smiling is never explained but I love all the humorous interchanges between him & Spencer. Perhaps in one of the sequels there may be some closure around this. Regardless I’m looking forward to hearing more about Shay’s story, so I’ll definitely be looking up “Hothouse Flower”, as well as Mia’s story “Jailbird”. Overall an sweet, enjoyable, clean read. I don’t think you will be disappointed. A lovely read I was excited to find a author that isnt all about the act of love it was more about the falling in love part and that is wonderful. Its great to see that there are still authors that are keeping it all about the love. A book that would be great for young adults to read. This book was full of those emotionally charged moments that I crave as a reader. It's more than just chemistry and physical attraction, although that is there in abundance as well. There is a building intensity throughout the book and I was so caught up in it. I honestly could not put it down. [This is where I freely admit how annoyed I was at EVERYTHING that pulled me away from this book the day I was reading it. Taylor Dean lives in Texas and is the mother of four grown children. Upon finding herself with an empty nest, she began to write the stories that were always wandering around in her head, quickly finding she had a passion for writing, specifically romance. Whether it's paranormal, contemporary, or suspense-you'll find all sub-genres of CLEAN Romance in her line-up.